Located centrally in Ballston, with an urban walkability score of 97. With close proximity to the Ballston Metro station (only 1 block from The Jefferson), you’ll have easy access to Washington, DC, and the city’s museums, theaters, and restaurants. When you arrive at The Jefferson, located centrally in Arlington’s lovely Ballston neighborhood, you will feel as if you’ve arrived at a luxury hotel. Our high-rise building has 21 floors and two towers, housing 325 condominiums, each unique with different finishes. When you purchase a home at The Jefferson, you are buying in to a vibrant, active lifestyle with a slate of high-end amenities. 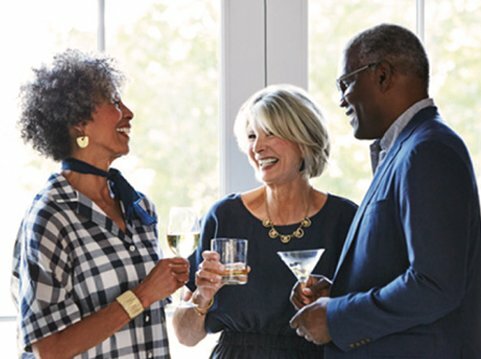 Not only do our residents enjoy fine dining that rivals the cuisine of local 5-star restaurants, but we have a tight-knit group of residents who enjoy weekly happy hours, lectures, and frequent trips to Washington D.C.’s cultural spots, such as the Kennedy Center, the National Harbor, and the Arena Stage. Also nearby, residents enjoy the community’s close proximity to the shops and dining at Market Common Clarendon and Ballston Quarter. Among the many benefits of life at The Jefferson is the freedom of living independently in your own home, without the worries or challenges of maintenance. Our community was carefully designed to help you live as independently as possible, balanced with the peace of mind of knowing help is there should the need arise. We would love to talk with you about what life is like at The Jefferson. Give us a call and set up a time to come in, take a tour, and meet with our team. Book online, call 703-348-1215 or email us to schedule a visit. We look forward to meeting you!